The external design of Treefield Villa is totally unique. Treefield Villa is also very special internally, well above the standard of a typical Disney-area home! But what about the games room? 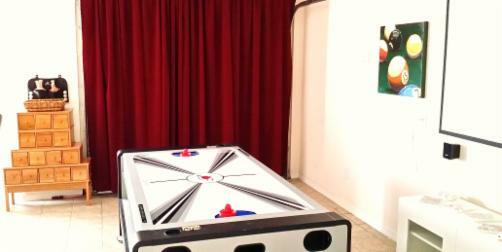 In a Disney-area home, there is usually either no games room or there is a small games room in a humid, concrete garage. Treefield Villa is the model home and the games room was previously the sales office for the High Grove community. As a result, the games room has fans and air conditioning returns and is a properly tiled room, around twice the size of a more "normal" garage/games room. 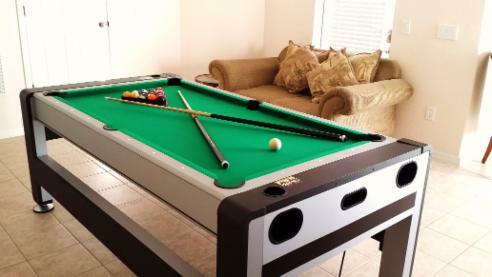 Treefield Villa offers a games table with pool, air hockey and table tennis. It is unusual that a villa will offer all three, but this is indicative of the quality of Treefield Villa. ... A CINEMA PROJECTOR WITH A 105" SCREEN! This is a feature that you will not find in many Disney-area villas. 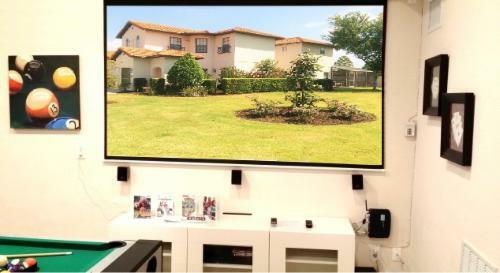 Indeed, we have spent nearly twenty years looking at Florida villas to rent and buy, and there are only a handful of villas that also have a cinema screen. Most of these villas would cost several times as much to rent as Treefield Villa! Watch TV, movies or choose from a large selection of Wii games. You could even bring your own console or games to play on the big screen, or connect your laptop to the screen!